Cuban Agriculture: To Be or Not to be Organic? Cuba has made an effort to transform its state-run commercial agriculture system into an environmentally- friendly and viable organic-oriented agricultural production system. A growing literature discusses the Cuban experience of the last decade as a new Cuban agricultural revolution. What happened in Cuba? What did Cuba do? Why was it done? What factors will affect the long-run viability of this new production system? With the 1989 collapse of the centrally planned economies in Eastern Europe and the 1991 dissolution of the Soviet Union, Cuba lost its major markets and its primary source of foreign assistance. Losing cheap Soviet oil also triggered a Cuban energy crisis. With the loss of these massive trade and aid subsidies, Cuba suffered the full consequences of almost 40 years of resource misallocations and heavily subsidized, inefficient production. As a result, Cuba’s economy collapsed and the full effect of the U.S. embargo could be felt. Cuban foreign trade plummeted 75 percent, and economic output fell about 40 percent. Cuba faced severe shortages throughout the economy. 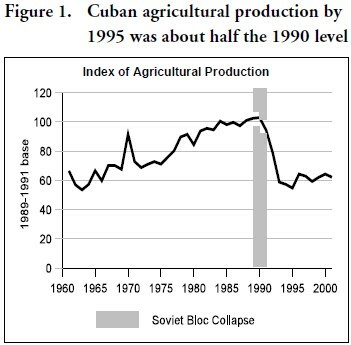 From 1989 to 1994, Cuban agricultural production fell 54 percent. Particularly hard-hit were sugar and tobacco production. 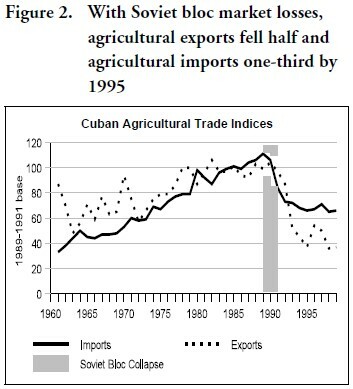 Cuba’s agricultural trade also declined during the 1990s. Agricultural exports fell 50.2 percent from 1989-91 levels, and agricultural imports fell 31.5 percent. 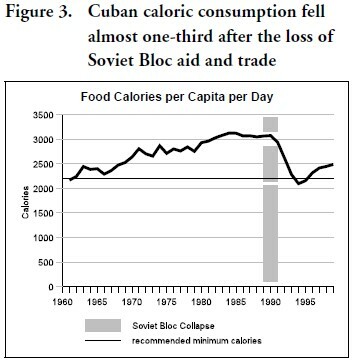 Cuba’s urban population was highly dependent on imported food and suffered the impact of these losses the most. With commercial and subsidized imports dwindling, they were forced to rely on domestic production for their food needs. However, the country’s inability to purchase agricultural inputs had already triggered a large drop in domestic food production. The declining energy supplies further hampered Cuban food production and marketing. These food production shortages, when combined with a major reduction in the energy supplies required to support food processing, transportation, and refrigeration systems, created major food shortages in urban areas. Cuba’s food consumption fell 36 percent. Daily caloric consumption plummeted from 3,052 calories per day in the 1980s to 2,099 calories per day in 1993. Some reports coming out of Cuba even indicated caloric consumption fell to as low as 1,863 calories per day. (The U.S. recommended minimum is 2,100-2,300 calories per day). For the elderly and the young, those most dependent on state rations, consumption fell to 1,450 calories per day. To survive, Cuba was forced to make major changes in its economic structure. The Government began opening the economy to limited market forces and pursuing more open trade. At the same time, it significantly cut imports, particularly fuel imports. In 1990, Cuba announced a “Special Period in Time of Peace” economic austerity program that rationed food, fuel, and electricity. Domestic food production, tourism development, and biotechnology were given priority status. The collapse of the country’s sugar sector and its poor future prospects further emphasized Cuba’s need to diversify agricultural production. To bolster consumption, the Government, under its “precios diferenciados” (differentiated prices) system, increased the amount of products offered Cubans at free-market prices. As a result, Cubans had greater access to such products as beverages, cigarettes, seafood, bread, and bicycles. In 1993, Cuba allowed free circulation of U.S. dollars and introduced a convertible Cuban peso in an attempt to eliminate the black market and increase exchange rate stability. To keep dollars circulating in the economy, Cuba also instituted a system of dollarbased incentives for workers in key industries, including tourism, fisheries, merchant marine, tobacco, sugar, energy, biotechnology, and nickel. The Cuban Government attempted to increase domestic food production by restructuring the agricultural production system and providing increased incentives to farmers to improve productivity. In 1993, the Government broke up many large state farms into a new form of cooperatives, the Basic Units of Cooperative Production (UBPCs). While land ownership remained with the state, these cooperatives had the right to use the land and make limited production and resource decisions. State enterprises still provided marketing, technical assistance, production services, and production inputs. The Government further encouraged food production by providing a large portion of prime agricultural land to individual farmers for use in producing selected food crops. In 1994, Cuba established farmers’ markets, enabling growers to sell surplus production (production beyond quota obligations to the State) at free-market prices. By the end of the decade, farmers’ markets handled 25-30 percent of the farm products available to Cuban consumers. Structural changes in Cuba’s commercial agricultural system, however, were only partly successful in increasing food production. Production continued to be hampered by a lack of purchased inputs and energy supplies. With little access to fuel, fertilizer and pesticides, farmers were forced to adopt a more organic, sustainable approach to food production. In many areas, draft animals even replaced tractors. By the mid-1990s, agricultural production showed some signs of a rebound. Still food shortages continued to plague Cuba’s urban areas. In response, urban residents began raising their own food wherever they could find a place to grow it, giving rise to an new urban gardening movement. The Government supported these attempts by instituting a National Urban Agricultural Program. This program attempted to bring poor and underutilized urban land into agricultural production through the creation of intensive fruit and vegetable gardens. It encouraged the development of both private and commercial gardens. The program’s primary goal was to provide food for Cuba’s urban population beyond that available from the commercial agriculture sector. These efforts were reasonably successful in increasing the availability of fresh vegetables, roots, tubers, plantains, and non-citrus tropical fruits to urban consumers, first in Havana, then in other Cuban urban centers. 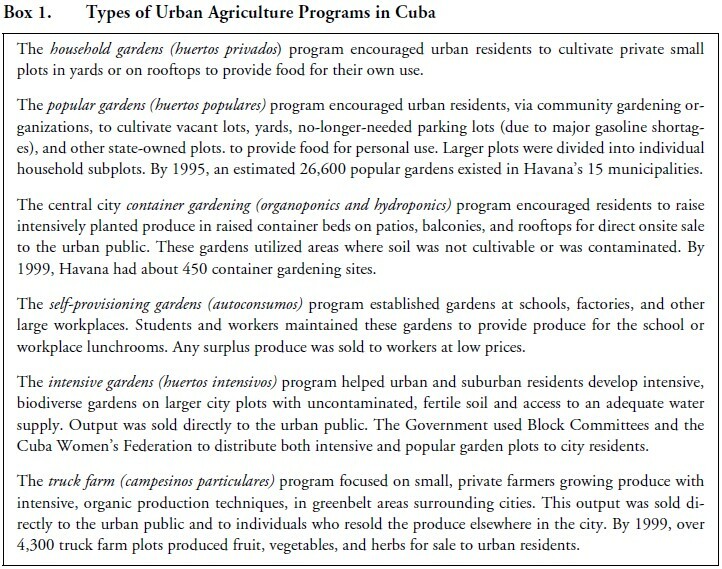 Cuba’s urban gardening programs encouraged the development of an environment-preserving agricultural production process that used minimal purchased chemical, fertilizer, and other inputs and that depended heavily on increased labor and management inputs and on intensive intercropping of vegetables and fruit trees. These programs promoted the intensive use of compost and manure mixed into the soil to increase yields without having to purchase the now unavailable commercial fertilizers. Even when not banned in urban areas, commercially-attainable chemical pesticides were not available. Therefore, these gardening methods also stressed biodiversity and the use of interplanting to minimize pest and disease outbreaks and maintain soil fertility. Raised garden beds and composting were encouraged to conserve soil and retain moisture. Trained agronomist extension agents promoted organic gardening and farming methods, identified which crops grew best under specific conditions, diagnosed pest and disease problems, and recommended effective treatment strategies to increase yields and deal with any occurring pests and diseases. Government-operated seed stores (Casas de Semillas) provided inexpensive seed and gardening supplies, and “how-to” radio and television programs supplemented agricultural extension agent services. By 1996, urban gardens in Havana supplied about 5 percent of the city’s food needs. Two years later, according to Eugenio Fuster, Director of Havana’s urban agricultural program, Havana was growing about one-third of Cuba’s vegetables. By the end of the decade, Cuba had about 2,600 large city gardens, about 3,600 smaller intensive city gardens, and over 93,000 small gardens planted by families for their personal use. In 1999, Martin Bourque, Program Director for Sustainable Agriculture, Food First, estimated that Cuba’s minimal-purchased-input urban agriculture produced about 46 percent of the country’s fresh vegetables, about 13 percent of its roots, tubers, and plantains, and about 38 percent of its non-citrus tropical fruit. According to other estimates, that these small family-oriented garden plots now provide employment for over 326,000 Cubans. • The dire state of urban Cuban diets in the early1990s. • The loss of imported fuel, fertilizer, pesticide, herbicide, etc. • The Government’s legalization of farmers’ direct sales to consumers, sanctioning farmers’ markets, and deregulation of food prices. • The Government’s active promotion of urban gardening programs. These incentives enabled urban farmers to earn 2-3 times the income of many urban professionals. Farmer incomes ranked in the top 10 percent of the population, above those of many medical doctors and academics. While the loss of traditional commercial agricultural inputs and the need to feed the population were the driving forces behind Cuba’s urban minimal-purchased- input agricultural programs, the success of the programs helped spread organic production practices into Cuba’s more rural commercial agricultural sector. By 2000, urban and rural minimal-purchasedinput area was an estimated 1.5 million hectares out of Cuba’s total 2.5 million hectares of non-sugar cropland. In spite of successes, Cuba’s urban agriculture program faces several problems that limit further expansion. Seed shortages continue. Land remains in short supply. Soil quality of available land is low. Many years of spilled pollutants have contaminated much of the available urban land. Significant portions of land are covered with litter. The major problem, and the hardest to address, continues to be a fresh water shortage. This shortage is further compounded by Cuba’s dilapidated infrastructure, which constrains movement of available water, and the lack of energy needed to power pumps. Will this organic-oriented production trend continue or reverse itself as Cuba’s economy improves? Cuba’s organic-oriented agriculture and urban farming movements grew out of an economic crisis that generated severe food shortages. Market and price incentives, coupled with large supplies of low-cost labor and massive shortages of other kinds of inputs, gave rise to Cuba’s organic-oriented agricultural production. Will those incentives and conditions continue to exist? Global demand for organic foods continues to grow, particularly in the higher income economies of North America, Western Europe, and Japan. Developing countries, including Cuba, are also beginning to demand a larger component of organic produce in their diet. If Cuba continues increasing food production to the point where exportable surplus exists, it could become an exporter of organic agricultural products, including tropical fruits, vegetables, and root and tuber products. To do so, however, Cuba’s production would need to become “certified” organic prior to entering these niche export organic markets. Cuba has already, by necessity, met many of the organic production criteria for a large part of its agriculture. It has not become, or needed to become, “certified” organic for its domestic market. Most developed countries require organic food imports to be certified as organic. To obtain certification, Cuba must provide the proof and documentation of a sufficiently long enough period in which it has produced agricultural products under organic production practices consistent with organic-certification standards. By 2001, Cuba had produced Swiss-certified organic citrus juices and sugar for export and packaging in Switzerland for European markets. In addition, Cuba had started a similar Swiss-certified evaluation process for coffee and cocoa, as well as mangoes, coconuts, and other tropical fruits. Is the market price premium high enough to create incentives for Cuban producers to continue supplying organic products? As the country’s economy continues to growth, the labor supply available to organic farming will both shrink and become more costly. Bolstered by higher incomes and the increased availability of foreign exchange, Cuba will likely resume imports of agricultural inputs and commercial input prices will decline. If fuel, chemical fertilizer and pesticides again become readily available and relatively cheap, will farmers again start using them to increase production? Higher incomes and increased availability of foreign exchange will also make it easier for Cuba to import food products. Cheaper food imports could reduce the demand for domestically produced food. The resulting lower prices could weaken incentives to expand domestic production, particularly if production costs remain high. Cheap food imports would then reduce incentives to continue domestic organic food production. Changing the relative price of organic and non-organic inputs would also affect farmers’ production decisions, including the choice of crops to raise. Changes in the relative prices of domestically produced and imported foods could have similar effects. It is not clear how these conflicting forces will balance. The global market for organic produce will likely continue to grow. If the input and output price incentives continue, Cuba could find itself with an “organic” comparative advantage in world markets. If not, Cuba’s organic era may only have been the result of a unique set of circumstances brought about by the extreme hardship imposed by the combination of the collapse of the Soviet Bloc economies and the U.S. embargo. Even without an organic approach to food production, is Cuba’s urban gardening system viable? In Cuba, both were an integral part of a common development. That integration is not required. While it is possible to have a high-tech and chemical-based production system in a small-scale gardening environment, it is unlikely to be sustainable at levels sufficient to provide a significant portion of a city’s food needs. Most high-tech and chemical technologies employed respond to economies of scale. Incentives to grow into commercial operations will exist and production will shift away from central cities to areas with less severe constraints on land. 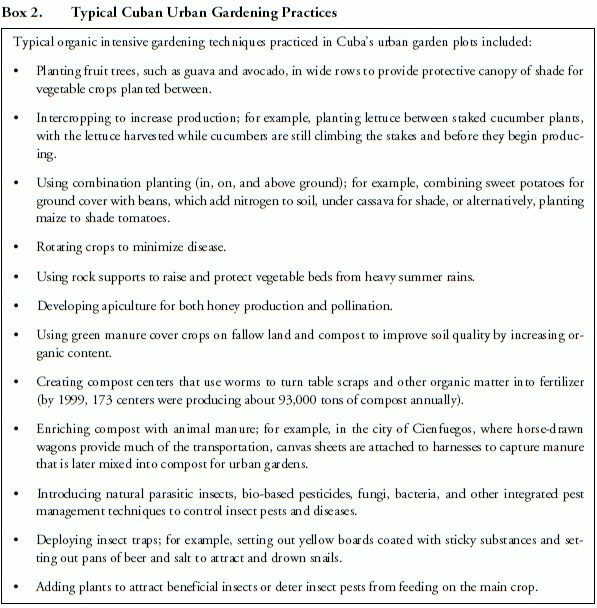 Urban gardening systems are also labor-intensive systems. As long as labor is freely available or wages are low elsewhere, urban gardening can afford to utilize high-labor production techniques. As the Cuban economy grows and recovers, the demand for labor in other industries will grow and wages will rise. Because it will be more profitable to work elsewhere, labor would likely be drawn away from the urban gardens. Replacing labor with mechanization could also shift production away from urban locations. Mechanization also generates benefits from economies of scale. Thus, fewer and fewer urban gardens would remain producing for the urban markets. At the same time, economic growth in Cuba should make commercial agriculture enterprises more profitable, more productive, and better able to supply food to urban markets. Marketing infrastructures should improve. With higher incomes, urban workers would be more able to purchase needed food. Commercial agricultural sources would become increasingly competitive with food from urban gardens, and urban workers would increasingly quit growing their own food. While there might continue to be urban gardens, it is unlikely that they will have a long-term role in providing a substantial portion of urban consumers’ food needs. In addition to the above European markets, the successful expansion and viability of Cuba’s organic production may also depend on access to geographicallyclose, high-income foreign markets, namely the United States and Canada. Currently, Cuban produce is not certified-organic in either of these markets. Only after Cuban products are certified for these countries could Cuba legally export produce labeled organic to these markets. Given that many technical production practices currently followed by Cuban producers are potentially compatible with U.S. certification standards and given Cuba’s prior experience in becoming Swiss-certified, Cuba could be well positioned to meet U.S. certification standards. For the U.S. organic market, in addition to a lifting of the U.S. embargo, Cuba would have to be certified by a USDA-accredited certification program that assures U.S. markets that Cuban products labeled organic meet all National Organic Program standards and regulations under the U.S. Organic Foods Production Act of 1990. If the U.S. embargo on Cuba were lifted, Cuban exports, once certified, could play a significant role in the U.S. organic market. In this current U.S. niche market, production costs are high. Opening the U.S. market would enable Cuba to exploit its significant comparative advantage in this area. This market could become a quick foreign exchange earner for Cuba. The largest barrier Cuba faces in expanding into the U.S. organic market will be meeting U.S. requirements for organic certification. Tapping the U.S. market may create sufficient price incentives for Cuban producers to take the necessary steps to meet the organic standards of other importing countries. Cuba could then expand production of organic produce geared to these specialty export markets. With sufficiently high prices for organic produce, urban labor may remain active in an organic urban gardening sector. Most likely, the viability of a vibrant organic produce production and processing sector in Cuba will depend on Cuba’s gaining access to the large, nearby U.S. market. Without such access, organic-oriented production of horticultural products in Cuba will likely remain a necessity-driven way to produce food for domestic consumption in an environment where other production approaches are just not available. The U.S. market is large and diverse. The demand for organic produce is only one portion of that market. How Cuba’s horticultural industry responds to restored U.S. trade will be a function of the relative price and cost incentives of the organic and non-organic market segments. If the organic price premiums are sufficient, Cuba has the climate, land resources, low-cost labor, and history of organicoriented production to allow it to develop and grow its horticultural sector in that direction. If the market incentives are not sufficiently large to pursue the organic produce market, Cuba will return to a chemical- and technology-driven, yield-maximizing, and labor-minimizing commercial production as rapidly as they can afford to do so. Cuba will have some incentive to increase domestic food production as rapidly as possible to feed the domestic population, rather than importing food for domestic consumption. Cuba could then use a larger share of its scarce foreign exchange to import energy, technology, and other inputs to support growth in other sectors of the Cuban economy. Cuba has developed an alternative organic-oriented agricultural production and distribution system. That system was developed to respond to a crisis brought about by a set of unique circumstances, but may not be viable in the longer run. Only with sufficient economic, social, and political incentives will Cuba’s system evolve into anything like a sustainable organic-oriented approach to food production. The conditions Cuba faced—dire straits, a lack of alternatives, and a command economy to create this system of near-organic and urban agriculture—are unlikely to be replicated elsewhere. Resource constraints and relative prices in most other economies will not favor a profitable, similar production system. Still, other countries faced with resource constraints and food shortages should look to underutilized resources—particularly surplus labor—and consider unconventional production techniques to make those resources productive. Locally grown fruit and vegetables can significantly augment a country’s commercial production and imports, but will not, however, provide long-run food and agriculture solutions. 1. This paper summarizes material from William E. Kost, “Cuba’s Vegetable, Pulse, and Tuber and Root Crops Sectors,” draft manuscript (August 2004); Kost, “Cuba’s Tropical Fruit Industry,” FTS-309-02, Electronic Outlook Report from the Economic Research Service (April 2004), available at: http://www.ers.usda.gov/publications/fts/APR04/fts30902/ ; and Kost, “Cuba’s Agriculture: Collapse & Economic Reform,” Agricultural Outlook (October 1998), available at: www.ers.usda.gov/publications/agoutlook/oct1998/ ao255h.pdf.